Come and join us on board the beautiful Princess Caroline as we celebrate the 2019 Cowes, Isle of Wight Fireworks Night. Interested? Comment below to secure your tickets. It’s set to be a great night, so don’t miss out. November 23rd – spread out the party season! December 6th – Thursday Lunchtime – no babysitter problems! December 7th – Evening – last few places left. December 9th – Lazy late Sunday lunch with lots of dancing still AND fine to get up the next day as finishing by 7.30 / 8.00pm – What’s not to like about that! Enjoy a two or three course Christmas dinner with Christmas crackers and party hats and table service. Fully licensed cash bar. 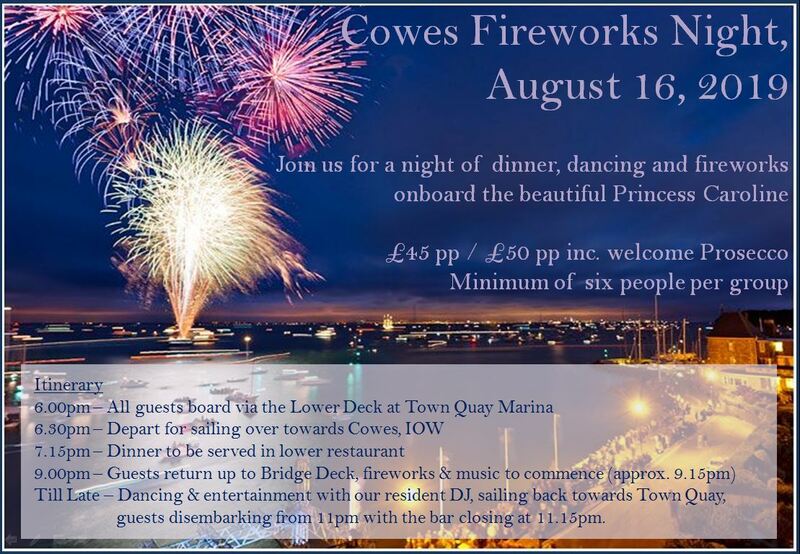 Come and join us on board the beautiful Princess Caroline for an evening of good food, fireworks, musical entertainment and more. 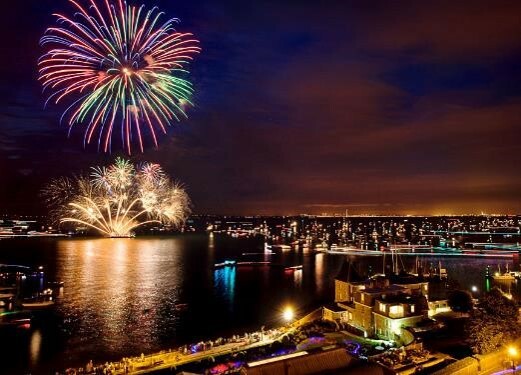 August 4 is Cowes Annual Fireworks display so book now to avoid disappointment! Leaving Ocean Village Village Quay at 18:30, we will cruise down the Southampton waters to Cowes. On route you will enjoy a three-course meal with a cash bar available all night. 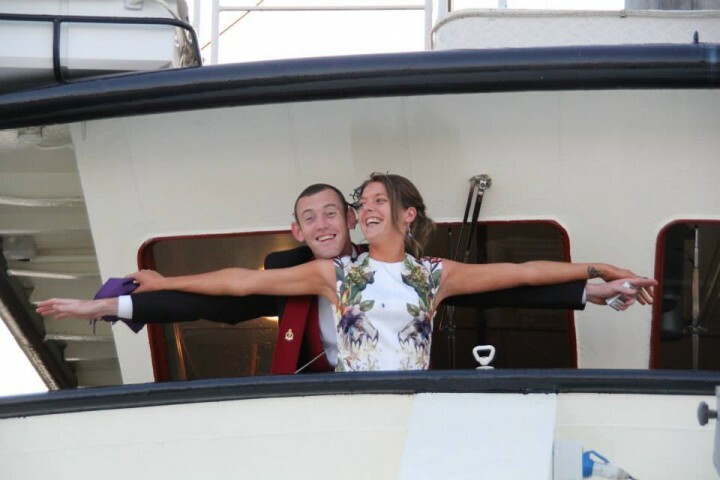 Tickets are £42 per person and should you wish, there is an optional nautical dress code for the evening. For more information – please get in touch! Want to do something different ? Ask about our themed parties – chance to dress up, have a bit of fun, great food, great entertainment and dancing the day/night away. When you think of a celebration and think of a location, where else can offer an exquisite venue, changing scenery, excellent service and quality food. 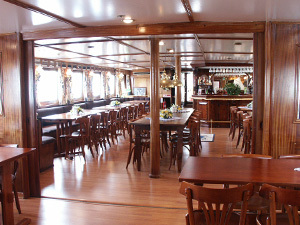 The Princess Caroline offers not only an interesting history but all of the above. A simple phonecall to me ANDI VAN DEN HOEK starts the ball rolling and checks availability. Princess Caroline has been priveleged to share the magical moments at a number of these amazing events and it just shows the diversity that the Princess Caroline and her staff are capable of hosting. 18, 21st, 40, 50,60,75, 80 and 90th Birthday parties. (Plus many more). Wedding anniversaries that have included : Diamond, Ruby, Golden and many many more to mention – over the last 12 years I am sure we have covered them all. 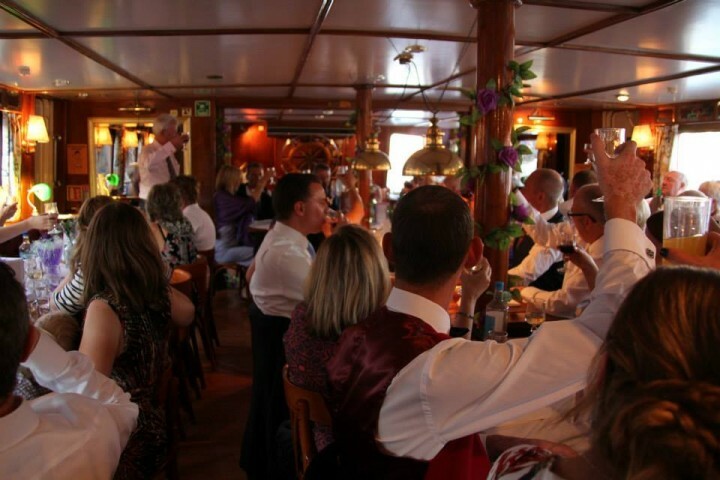 We theme the ship for any type of party you can mention with entertainment from live singers, jazz bands, string quartets, DJs, celebrity chefs, charity events, casino nights and fine dining experiences second to none. Our standards are consistent, so much so, clients that have been on board come back year after year and soon become ‘old friends’. We offer a service that treats you like good friends and are always pleased to see you come back with new people . This is one place you will be pleased to know – welcomes you aboard to drink and dance with us and looks forward to seeing you again and again. So please give us a call, our menus are flexible and we can ‘Work things out’ to meet your budgetary needs. Come and join the party, fill the boat and have a great night out – after the busy Christmas period take the time to unwind and have some FUN with us. When you can bring the United Nations together in one place – the Princess Caroline MS is the perfect venue, with ever evolving scenery. Scott & Ruth chose the Princess Caroline to bring together friends and family from as far a field as South Africa, Lesothto, Malawi and Northern Ireland to namedrop just a few of the countries present, on a Sunday afternoon to dance and celebrate their wedding day. A vibrant and energized reception which included a disco and cultural mix of welcoming by the ladies, showing a combination of dance and song to mark such a special day. 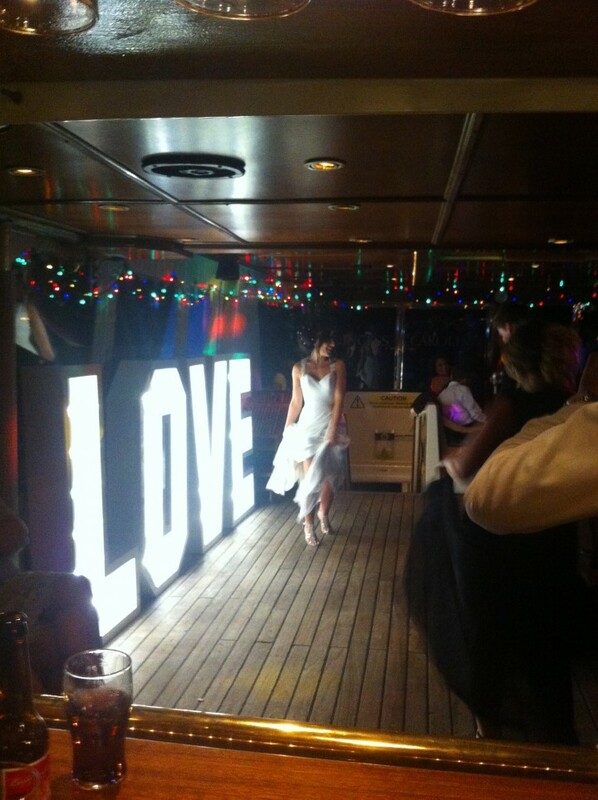 Ruth and Scott it was and is a pleasure to have you join us for your special day – an amazing experience. I just wanted to drop you a line or two to say thank you for a wonderful evening! Our staff and guests thoroughly enjoyed themselves and have even said its was our best Christmas party yet!!! Your hosting was amazing and we will be booking again (Hopefully in the summer) to enjoy the views. 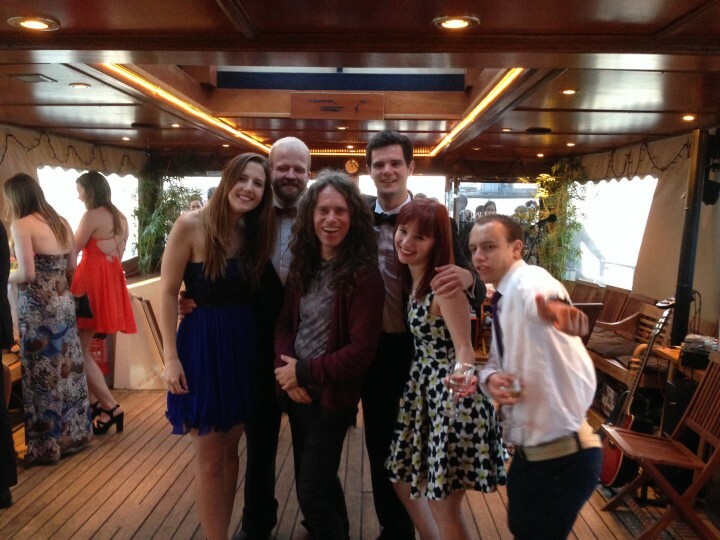 Apologies if we took over a bit, I hope the other guest didn’t mind as I think we was really enjoying the atmosphere. If there is anywhere where I can write a review let me know, as I will be thrilled to say what a great venue the Princess Caroline is!